The structure of U.S. agricultural production changed dramatically during the 20th Century. Major technological innovations transformed the relationship between agricultural inputs and outputs, and contributed to rapid increases in agricultural productivity. However, evidence is mounting that suggests we have entered a new era, with substantially lower rates of productivity growth. 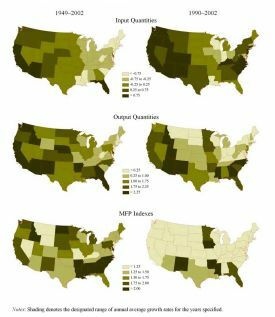 In this article, we examine trends and spatial patterns in agricultural input use, production of outputs, and productivity. We focus on productivity growth over the period 1949–2002, and find a statistically significant slowdown in productivity growth after 1990. The analysis presented here is based on the book by Alston, et al (2010), which provides complete details on the data, sources, and analysis. The InSTePP (International Science and Technology Practice and Policy Center, University of Minnesota) production accounts that underpin this analysis consist of state-specific measures of the prices and quantities of 74 outputs and 58 inputs for the 48 contiguous U.S. states. In developing the InSTePP data, special attention was given to accounting for variation in the composition of input and output aggregates, with particular reference to the quality of inputs and outputs and the spatial dimensions. Inputs are grouped into four broad categories: land, labor, capital, and materials inputs. During the 20th Century, technological advancements transformed inputs such that their quality has generally increased over time. Our measures of input use account for major quality changes within the four broad categories, and the changing composition of the aggregate. The apparent decline in the use of agricultural inputs is offset somewhat when we account for these changes. Over the period 1949–2002, the aggregate quantity of input fell at an average rate of 0.11% per year for the United States as a whole, but rates of change in input use were widely dispersed around this average. State-specific annual average rates of growth ranged from -1.99% in Massachusetts to 1.18% in Florida. While input use declined in most states, it increased in 15 states, primarily in the Pacific, Mountain, and Northern Plains regions. Table 1 presents the annual average rate of growth in input use by region and input category, as well as additional measures corresponding to growth in the quantity of output and productivity, described later. In addition to the spatial variation in overall input use, we also see very different patterns in the four input categories. Land inputs consist of three broad categories—pastureland, nonirrigated cropland, and irrigated cropland. For the United States as a whole, agricultural land use decreased by 0.07% per year over 1949–2002. After adjusting for quality and compositional changes, notably those brought about by the growth in irrigated acreage, measured land use grew by 0.25% per year in the Northern Plains, 0.08% in the Pacific region, and 0.02% in the Mountain region. These increases were offset by decreases in land use in the Central, Southeast, and Northeast regions. The labor data consist of 32 different categories, including family labor, hired labor, and 30 categories of operator labor, specified by age and education cohort. The quality change of the labor aggregate is particularly pronounced, because farmers are much better educated and more experienced on average compared with 50 years ago. Nonetheless, quality-adjusted labor use decreased in every state over the period 1949–2002, and decreased by 1.74% per year for the United States as a whole. The Pacific region, dominated by developments in California, had the smallest rate of decline in labor use, while reductions were much more pronounced in eastern states, especially in the northeast. Capital inputs consist of seven categories of physical capital and five categories of biological capital. We adjusted inventories of physical capital classes to reflect quality changes over time, in particular factoring in the changes in vintage, durability, and size of machines used on farms. For the United States as a whole, quality-adjusted capital use decreased by 0.10% per year, and decreased most dramatically in the Northeast and Central regions. Capital use increased in 23 states, with the largest increases occurring in the Pacific and Mountain regions. The materials input category consists of 11 different categories, including pesticide, seed, feed, fuel, electricity, rented machines, repairs, miscellaneous inputs, and three types of fertilizer. This is the only input category that increased for the nation as a whole (1.88% per year over the period 1949–2002). Use of materials inputs increased most rapidly in the Pacific region (2.58% per year) and most slowly in the Northeast region (0.65% per year). After aggregating among all measured inputs, the quantity of total input use in U.S. agriculture changed little in well over half a century. In contrast, the composition of input use changed dramatically, with U.S. agriculture now much more reliant on materials inputs purchased off farm and less reliant on labor. Total use of land and capital inputs was fairly constant, although the composition of specific inputs within these two broad classes of inputs changed markedly. U.S. agricultural production has grown rapidly since 1949, with concomitant marked changes in the composition and location of production. The total nominal value of U.S. agricultural production grew from $29.9 billion in 1949 to $223.5 billion in 2006, equivalent to a compound growth rate of 3.6% per year. Deflating by the implicit GDP deflator, the real value of U.S. agricultural production grew from $183.0 billion in 1949 (2000 prices) to just $191.5 billion in 2006. The value of U.S. agricultural production has varied over space and time, reflecting the impacts of changes in prices and quantities of inputs and outputs, changes in technologies, and a host of factors that directly or indirectly affect these variables. While the value of agricultural output grew during the 20th Century, regional and state shares did not change much until the post-WWII years. Changes in domestic and export demand as well as changes in off-farm technology contributed to changes in the composition of demand for U.S. agricultural output, which in turn contributed to changes in the composition and location of production. Major structural changes, such as the shifting geography of population and the substantial migration of labor off farms—combined with improved communications, electrification, transportation, and logistical infrastructure—meant that perishables and pre-prepared foods needed to and could be moved efficiently over much longer distances. This contributed to the changing spatial patterns of production in the second half of the 20th Century. Technological innovations on- and off-farm underpinned many of these changes. The output data cover the period 1949–2006. Aggregate output quantity increased by an average of 1.68% per year over this period for the United States, so that output in 2006 was 2.6 times the output in 1949. At the same time, production tended to shift south and west. In 1949, Iowa and Texas were the largest states in terms of agricultural production, with 8.0% and 7.5% of the 1949 value of U.S. production, respectively, and the Central region produced more than one-third of the entire U.S. agricultural output value. California was the fourth-ranked state in 1949, producing 5.8% of national production. By 2006, the regional distribution of production had shifted substantially. The Central region’s share of U.S. production value decreased to 30.8%, while the Northeast region’s share fell from 9.6% in 1949 to 5.7% in 2006. The big increase was in the Pacific region, whose share roughly doubled over the 57-year period, from 8.3% of U.S. agricultural output value in 1949 to 16.3% of the 2006 total. As shown in Table 1, the output quantity index grew faster in the Pacific, Northern Plains, and Mountain regions than the nation as a whole. Not only did the spatial composition of production change, the mix of outputs changed as well. The 74 different categories of outputs can be grouped into the broad classifications of livestock, field crops, specialty crops, and miscellaneous outputs. The livestock category includes 9 commodities, and the aggregate quantity of livestock produced increased by 1.39% per year, which is the slowest rate of growth of the three output categories included in Table 1. Furthermore, the value of livestock as a share of agricultural production trended down over the past 50 years, declining from about half of the value of U.S. production in the 1950s to around 45% in more recent years. A significant amount of livestock production moved out of the Central and Northeast regions to become increasingly concentrated in the Southern Plains and Southeast regions. The field crops output category consists of 17 different crops, and the total quantity produced in this category grew at about the same rate as all outputs combined, but with a great deal of regional variation. Growth in field crop production was particularly pronounced in the Northern Plains and Central regions at 2.60% and 2.29% per year, respectively, and quite modest in the Southeast, Northeast, and Pacific regions. The value share of field crops jumped to more than 40% of the U.S. total value of production in the 1970s and 1980s when commodity prices were historically high. Aside from this period of time, the share of agricultural output value coming from field crops fluctuated around a generally downward trend, declining from approximately 40% of the total value of agricultural output in 1949 to around 30% in recent years. The specialty crop output category includes 18 fruits, 4 nuts, 22 vegetable crops, and an aggregate greenhouse and nursery products category. Production of specialty crops has increased dramatically since 1949, both in quantity and value. Output quantity in this aggregate increased by 3.5-fold, or 2.21% per year on average, and the value share of total U.S. production increased from less than 10% in the 1950s to more than 20% in the 2000s. The value shares for vegetables and fruit and nuts followed very similar paths over the latter half of the 20th Century–each increasing from about 3.5% in 1949 to 6.5% in more recent years. The value share of greenhouse and nursery products increased more rapidly, from less than 1.5% in 1949 to around 8% in 2006. Production of these crops tends to be spatially concentrated. For example, only 11 states contributed more than 1% of the value of production of fruits and nuts, and the top four producing states accounted for about 80% of the total U.S. value of production. Similarly, 18 states each contributed more than 1% to the value of production of vegetables, and the top four producing states accounted for just over half of the total U.S. value of production. In 2006, roughly half of the value of nursery and greenhouse production was concentrated in the top four producing states—California, Florida, Texas, and Oregon. The increased production and spatial concentration of these high-value crops help explain some of the spatial shifts in the value of production described above. The changes in agricultural inputs and outputs are reflected in multi-factor productivity (MFP), which is measured as the ratio of the index of aggregate output quantity to the index of aggregate input quantity. Measures of MFP growth were developed for each state, region, and the nation. 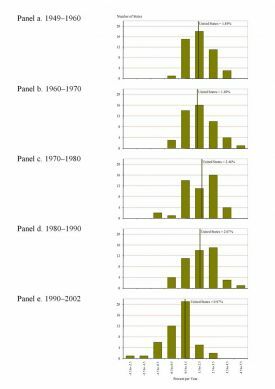 Maps in the first column of Figure 1 indicate the state-specific rates of growth in input use, outputs, and productivity over the period 1949–2002. Some states, such as California and Florida, had both inputs and outputs growing and some, such as Massachusetts and Rhode Island, had both falling, but the majority had output growing against a declining input quantity. The annual average rates of growth in MFP are shown in Table 1 by region, and the state-specific growth rates are indicated by the shading in the last map in the first column of Figure 1. During the period 1949–2002, all states had positive productivity growth, with substantial variation among the states. Productivity growth was most rapid in the Southeast region, with several states in the Northern and Southern Plains also experiencing above-average productivity growth. The pattern of MFP growth has varied widely over time. Year-to-year variations in measured productivity growth might reflect the influences of short-term factors such as weather impacts or policy changes; they might also be the result of measurement errors such as those associated with variable capital utilization rates; however, long-term changes in patterns of productivity growth are of more serious concern in the present context. In particular, accumulating evidence suggests that the rate of U.S. agricultural productivity growth may have slowed in recent years, perhaps as a reflection of a slowdown in the growth of total spending on agricultural R&D starting in the late 1970s, or a reduction in the share spent on productivity enhancing agricultural research and development (Alston, Beddow and Pardey 2009; Alston et al. 2010). It is not a trivial matter to detect structural changes in the process of productivity growth, given the substantial year-to-year movements and spatial differences, but our detailed data make it possible to test for structural changes. Evidence of a recent productivity slowdown can be seen in Figure 2, which shows distributions of multi-factor productivity growth rates by decade since 1949. Each of the distributions refers to a particular period, and the data are the state-specific averages of the annual multi-factor productivity growth rates for the period, a total of 48 growth rate statistics in each panel. By inspection, it can be seen that the general shape and position of the distribution of state-specific multi-factor productivity growth rates seems reasonably constant across periods until the last one, 1990–2002, when it shifts substantially to the left, indicating a widespread slowdown in productivity growth. A visual inspection of the MFP data reveals an apparent natural break in the data around 1990; therefore, we calculated and compared rates of productivity growth for the period 1949–1990 and for the remaining period, 1990–2002. Table 1 includes the U.S. and regional growth rates for each period. Over the period 1949–1990, multi-factor productivity grew positively in all 48 states, whereas during the period 1990–2002, multi-factor productivity growth was negative for 15 states, mostly in the northeast. Multi-factor productivity grew faster in the more recent period compared with the earlier one in only four states; with 44 states experiencing lower rates of productivity growth. U.S. aggregate agricultural productivity grew on average by just 0.97% per year over 1990–2002 compared with 2.02% per year over 1949–1990. The simple average of the 48 state-specific MFP growth rates indicates a larger difference between the periods, a paltry rate of 0.54% per year for 1990–2002 compared with 2.02% per year for 1949–1990. The maps in the right-hand column of Figure 1 depict the state-specific annual average input, output and multi-factor productivity growth rates for 1990–2002. Aggregate input growth was generally higher in the period 1990–2002 compared with the period 1949–2002, and notably so for most western states, whereas output growth generally slowed in the more-recent period. The combination of these reinforcing input and output trends resulted in the pervasive slowdown in multi-factor productivity growth that is especially evident in comparing the two maps at the bottom of the figure. We also conducted more formal statistical tests for a productivity slowdown using the state-specific MFP data for 1949–2002, and comparing growth rates for various sub-periods. Cognizant of the possibility that different measures of MFP growth may imply different findings, we started by calculating state-specific MFP growth using two different methods. The first method used the simple average of the annual state-specific estimates of MFP growth. The second used a regression of each state-specific MFP index in logarithms against a time trend such that the estimated coefficient on the time trend provides an estimate of the average growth in the index of MFP. We computed these alternative measures for each state and for various time periods defined in Table 2. Finally, we conducted paired t-tests for statistically significant differences in the state-specific growth rates before and after the split points. The entries in Table 2 refer to proportional growth in MFP, measured either as the average of year-to-year growth rates or the slope coefficient from a regression of the logarithm of the index against a time trend variable. In every case with either measure, the tests indicate a substantial and statistically significant (at the 10% level of significance in every case, and in most cases at a level of significance well less than 1%) slowing of productivity growth for any period that includes the years 1990–2002 compared with any prior period. The slowdown is most pronounced for 1990-2002 compared with 1949–1990. Finally, our most recent data on agricultural outputs ending in 2006 indicate that in the years 2000–2006, the annual average growth in aggregate output was 0.80% per year, which is less than half of the long run average of output growth of 1.68% per year over 1949–2006. Unless there was a large decrease in the quantity of inputs used in production for 2000–2006, the lower rate of output growth implies that average productivity growth was also substantially lower for this period. The evidence presented here supports the view that the recent productivity slowdown in agriculture is not a temporary cyclical event but more structural and sustained. U.S. agricultural production changed remarkably during the past 100 years. Changes in production and productivity were enabled by dramatic changes in the quality and composition of inputs, important technological changes resulting from agricultural research and development, and wholesale changes in the structure of the farming sector. While the quantity of U.S. agricultural output grew nearly 2.5-fold during the period 1949–2002, the measured quantity of aggregate input use has declined marginally, reflecting rapid growth in productivity. While U.S. agricultural productivity grew quickly through the 1980s, mounting evidence indicates a substantial, sustained, systematic, structural slowdown in the growth rate of U.S. agricultural productivity since then. Over the most recent 10–20 years of our data the annual average rate of productivity growth was half the rate that had been sustained for much of the 20th Century. Compounding over decades, the difference will have serious implications. Unless other countries with competing agricultural production experience comparable slowdowns in agricultural productivity growth, the United States will suffer a widening competitiveness gap. On the other hand, if other countries do experience comparable slowdowns in agricultural productivity growth, the consequences will be felt in a widening gap of a different sort: between growth in global supply and growth in global demand for agricultural products, with serious consequences for food security, especially among the world’s poor. Alston, J.M., M.A. Andersen, J.S. James, and P.G. Pardey. (2010). Persistence Pays: U.S. Agricultural Productivity Growth and the Benefits from Public R&D Spending. New York: Springer. Alston, J.M., J.M. Beddow, and P.G. Pardey. (2009). Mendel versus Malthus: Research, Productivity and Food Prices in the Long Run. Department of Applied Economics Staff Paper/InSTePP Paper P09-1. St Paul: University of Minnesota (revised September 2009). Notes: Average annual growth rates for inputs and multi-factor productivity span the period 1949–2002; for outputs they span the period 1949–2006. Notes: Annual growth was measured as the average of annual logarithmic differences. Regression results were calculated by fitting a linear trend to logarithms of MFP over the period specified. Column 2 refers to the average annual growth rate during the period defined in column 1; column 3 refers to the average annual growth rate during the period beginning with the year after the period defined in column 1 and ending in 2002. Jennifer S. James (jsjames@calpoly.edu) is an Associate Professor in the Department of Agribusiness at the California Polytechnic State University and a Research Fellow at the International Science and Technology Practice and Policy (InSTePP) Center at the University of Minnesota. Julian M. Alston (julian@primal.ucdavis.edu) is a Professor in the Department of Agricultural and Resource Economics, University of California, Davis and Associate Director, Science and Technology, at the University of California Agricultural Issues Center. Philip G. Pardey (ppardey@umn.edu) is a Professor in the Department of Applied Economics, University of Minnesota and Director of InSTePP. Matthew A. Andersen (mander60@uwyo.edu) is an Assistant Professor in the Department of Agricultural and Applied Economics at the University of Wyoming and a Research Fellow at InSTePP. We are grateful for research assistance provided by Connie Chan-Kang and Jason Beddow. The work for this project was partly supported by the University of California; the University of Minnesota; the USDA�s Economic Research Service, Agricultural Research Service, and CSREES National Research Initiative; the Giannini Foundation of Agricultural Economics; and the Bill and Melinda Gates Foundation.